Virtual Systems is a web site design and hosting company that specializes in corporate database integration. We provide the link between your company's existing information and the Internet. With over 34 years of experience in business application programming and database design, you can trust your data to Virtual Systems. High customer satisfaction is key to our clients. We retain professionals with the experience to complete your project on time, on budget, and to your satisfaction! This site features extensive photo galleries and drone video footage. Maple River Equipment allows the company to upload and update their for sale inventory anytime. 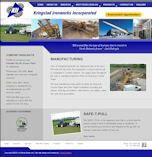 This website features an easily customized series of drop down menus and pages. It highlights their unique product offerings. Copyright ©2009, 2014, 2018 Virtual Systems, Inc., All Rights Reserved.